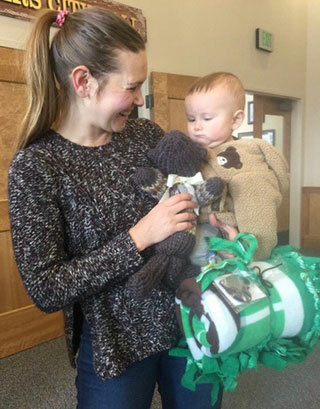 Last Tuesday at Sisters City Hall, a 10-month-old boy named Kaenon was gifted with a soft fleece blanket with footballs scattered across it. Additionally, he received a coordinating brown knitted bear to hug. He was accompanied by his mother, Ashlee, and grandmother, Laurie, of Sisters. Kaenon has had a rough start to his young life, having undergone seven surgeries since his birth. He and his mom came to Sisters to live with his grandparents because of his medical needs. When Kaenon was just two months old, tragedy struck the family when his grandfather died. So the blanket ladies also presented a blanket to his grandma to provide comfort to her. That's what the Heartwarmers volunteers do. Volunteers, now numbering 154 in groups in Bend, Sisters, and Redmond, gather twice a month to create fleece blankets and scarves, and knitted and crocheted hats and ear warmers, for premature babies, cancer patients undergoing chemotherapy, and homeless youth and adults. Lap robes and walker caddies go to seniors and hospice patients, and infant blankets that are edged with crocheting from donated yarn warm the smallest recipients. "Heart-tugger" dog toys and soft blocks for toddlers, as well as any number of specialty items, are created from the scraps left from making the blankets. "Not one scrap of fleece goes to waste," they like to say. What began with one warm-hearted woman of faith, Mary Tomjack of Bend and formerly of Sisters, making a few fleece cut-and-tie blankets as samples, has grown in five years time into a flourishing 501(c)(3) nonprofit. They were recently awarded a $30,000 grant by the Maybelle Clark Macdonald Foundation to cover the cost of all their fleece for the next two years. "We donate our gifts to 35 local nonprofits that work with children and adults in transition," Tomjack remarked. At the end of 2018, Heartwarmers had donated 4,425 blankets, 2,000 bears, and a cumulative gift-giving of 12,000 assorted gifts. When Heartwarmers heard about the efforts to support Jenny Cashwell's two daughters following the death of their mother, they immediately knew they needed to make special blankets for the girls. They will be given to the Fullhart Insurance office in Sisters where Jenny worked to be passed onto the girls. Tomjack recently worked with a local Girl Scout troop to make 23 blankets, including the one given to Kaenon. The blankets are made by joining two equal-sized pieces of fleece and tying the fringe around the edges of each piece together. There is no sewing involved and the blankets can be completed in one two-hour session. Sisters Heartwarmers workshops are held the first and third Tuesdays of each month from 1-2:30 p.m. at Sisters City Hall. There are teddy-bear-making sessions twice a month in Sisters at Suttle Tea. The bears playfully coordinate with the blankets, all by coincidence. For the month of February, Heartwarmers will be the recipient of the proceeds from Dining for a Cause sponsored by The Open Door. For those who feel the tug to join Heartwarmers or make a donation, they can be reached at 541-408-8505 or hwb.Heartwarmers@gmail.com. Tomjack can be reached at 503-880-5832. Visit their website at www.Heartwarmersco.org, which will also link with their Facebook page. Their office is located at 501 NE Greenwood Ave., Suite 700, Bend 97701. Tax-deductible donations can be made through PayPal on the website or by check sent to their office.